The temporary Guerilla Studio digs in Hampstead soon became party house central. It was one of those charming old London town homes with wonky passageways and a blue plaque on the front to denote a former occupancy by the great and good, in this case the painter John Constable. There was always a session of some kind going on, generally William Orbit or Laurie Mayer projects, but there was also a retinue of sound designers including Simon Fisher Turner and my old pal Nigel Holland, who could regularly be found attacking pig’s heads with hammers and imbibing alarming amounts of alcohol. What with all my travels I hadn’t done so much with William for a while. He had released the first of his excellent Strange Cargo album series and had also been going from strength to strength as a remixer. 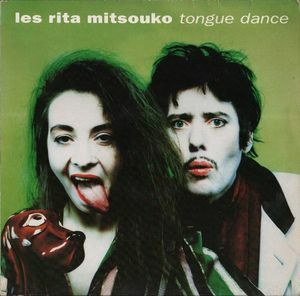 His stupendous remix of the S’Express show stopper Hey Music Lover had resulted in a partnership with Mark Moore that was to produce a lot of great work, starting with this mix for the fabulous french duo Les Rita Mitsouko. When I was in Paris in early ’86 I saw Les Rita’s Marcia Baïla video and was absolutely blown away. Fred Chichin and Catherine Ringer had made their debut album with german legend Conny Plank and it was superb. Their follow-up with Tony Visconti didn’t disappoint. So I made sure I was lurking around the studio when William and Mark were working on this, and in particular when Fred and Catherine came to visit. That’s me on the funky Juno 106 in this slamming remix.